Archive Business Centre Limited is not a Licensed ADR Dangerous Goods carrier and as such is only permitted to carry Dangerous Goods that are classed as ‘Limited Quantities’ – ‘Excepted Quantities’ or those that are otherwise officially ‘exempt’ as described by current legislation. 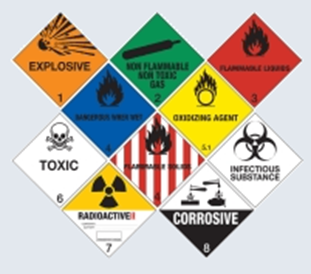 Archive Business Centre Limited may occasionally carry other types of Dangerous Goods and for further advice please contact us directly on traffic@abc-ltd.net before shipping. The sender or ‘shipper’ of the goods must notify us in advance when sending Dangerous Goods in ‘Limited Quantities’. This is done via our online booking software, selecting Limited Quantities’ (LQ) option under the Tariff section. The sender or ‘shipper’ of the goods is responsible for correctly identifying, packaging, marking and labelling all consignments of Dangerous Goods as required by regulations. Failure to do so may constitute a statutory offence. The latest Regulations have introduced a new style Limited Quantity mark for display on packages. For UK Mainland road transport under ADR 2011 requirements this mark may be used from now and becomes fully mandatory from 30th June 2015. Please note: – the mark has a minimum size of 100mm X 100mm and the UN number is no longer displayed, although certain items may require text displayed elsewhere on the package – e.g. ‘UN1950 AEROSOLS’. The information contained on this web page and attachments is provided as a guide only and is not to be regarded as legal advice. Archive Business Centre Limited accepts no responsibility or liability for the accuracy of the information displayed in this document. The ‘shipper’ or sender of the goods must ensure that they correctly identify, package, mark and label all consignments of Dangerous Goods, they must provide any required documentation and identify marine pollutants if and where required. The old style ‘Limited Quantity’ package mark seen below is a neutral colour diamond shape (minimum size 100mmx100mm) containing the Specific UN number for the substance preceded by the letters ‘UN’. This mark must be displayed on the outside of the package. Example old style package markings are illustrated below and may still be used until the new markings become mandatory. (Fig B) Package containing items of different UN numbers may display all of the UN numbers inside a single diamond shaped mark. Please note: Archive Business Centre Limited does not transport dangerous goods by aircraft. These are a few examples and there are many more. If you are unsure please contact traffic@abc-ltd.net and we will consult our ADR consult. Packages containing receptacles of liquids must display orientation ‘arrows up’ marks on two opposing sides of the package.